Though their credo is 'Geen Woorden Maar Daden'("No words but deeds")we thought it still appropriate to mention the new Official PUMA Feijenoord Rotterdam 09/10 Home Soccer Jersey! This completes the Big Three of Dutch Soccer (Ajax & PSV being the other two) who have also won most of the top flight league titles since 1965. 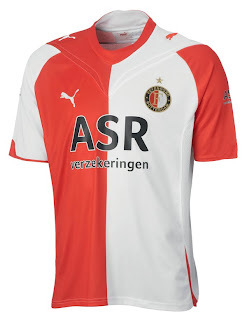 The traditional Feyenoord red & white split features this season's Puma aerodynamic V chest design, as well as the advanced U.S.P. technology, mesh panels and moisture-wicking weave for oustanding comfort no matter how long you play, train or cheer on your De stadionclub! Best of luck and keep it up.